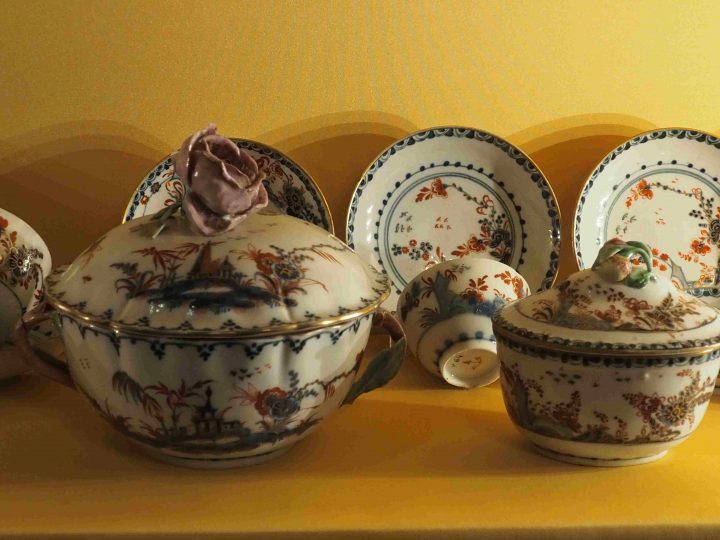 Nowadays you could believe porcelain is ‘demodè’, old-fashioned, but porcelain well reveals the spirit and the refined taste of 18th Century Europe and allows us to understand a lot of the way and style of living of a different time. 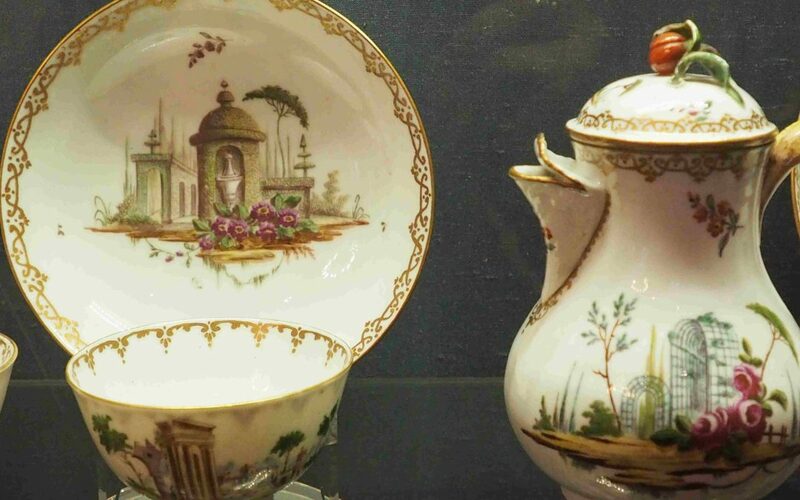 We would have no exquisite porcelain from all those sought-after names (such as Sevres, Limoges, Capodimonte, Nymphenburg, Villeroy & Boch, Rosenthal, Hutschenreuther) without the pre-eminent porcelain factory in Meissen close to Dresden. 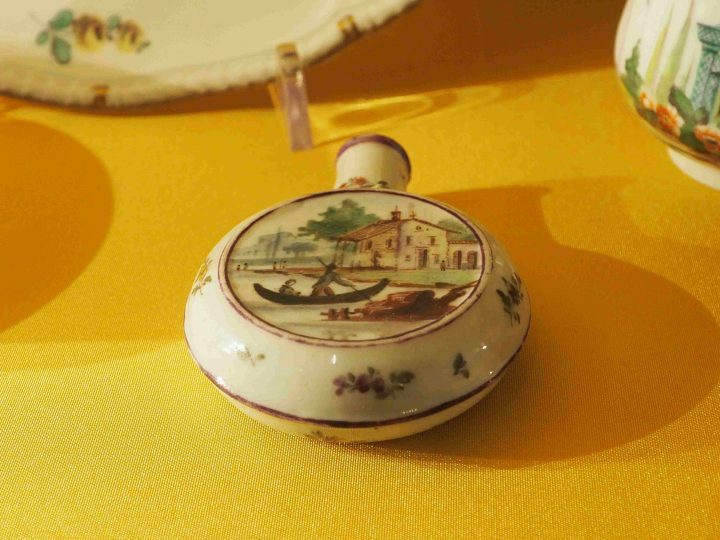 It all started with Böttger, his magic formula and Augustus the Strong (see Giovanni Vezzi: the third porcelain manufacture of Europe in Venice in the Ca’ Rezzonico Museum). 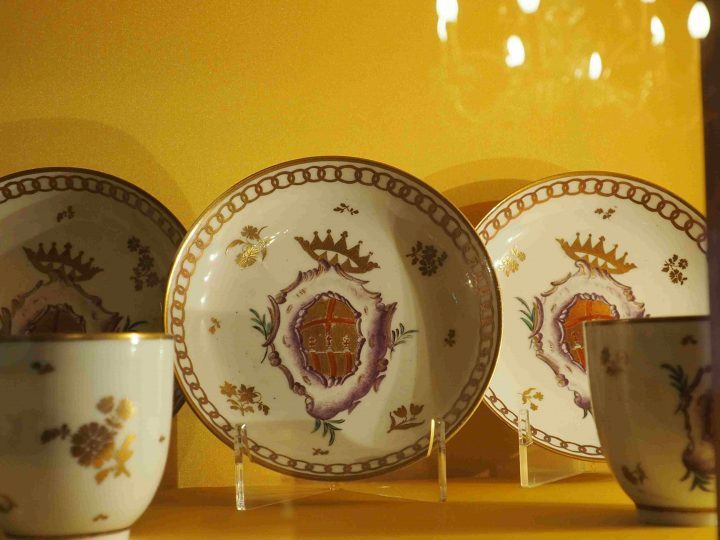 Besides the fine pieces of the Venetian porcelain produced by Vezzi and described in the above mentioned post, in the second Piano Nobile in the Cembalo room in Ca‘ Rezzonico Museum we can admire pieces of the highly admired second Venetian production by Geminiano Cozzi. As a signature under glaze he chose a red anchor, in some pieces covered with gold and in some very rare cases blue. A perfect sign for Venice! 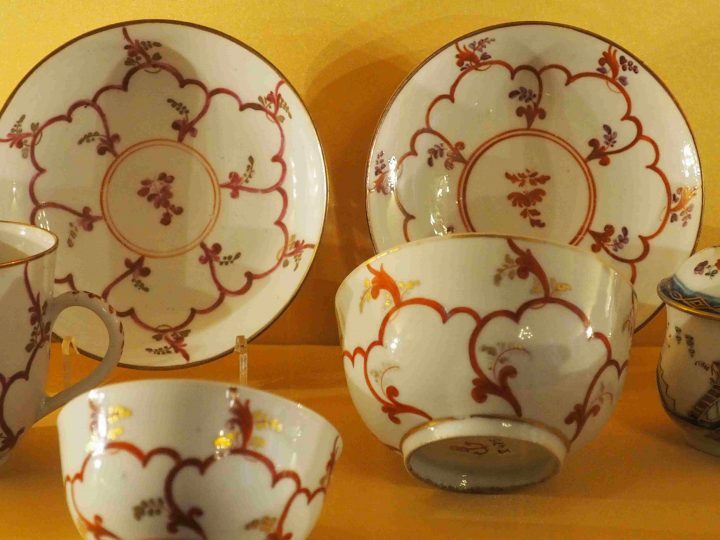 The Saxon merchant Nathaniel Friedrich Hewelcke and his wife emigrated from Meissen during the Seven Years’ war, opened in 1757 a first factory in Udine and then in 1761 in Venice, where Hewelcke was given a 20 year privilege of producing “porcelain of Saxony of any and all species”. Later he accepted as a partner Geminiano Cozzi. In 1763, once the war was over, Hewelcke returned to Saxony. The factory was closed, the factory went bankrupt. 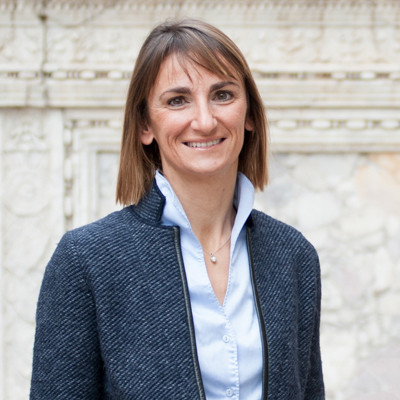 It is not clear, what really happened, whether Cozzi’s intention was of being then able to run the company as the only owner. A few years later, in 1765, Cozzi opened his own factory in Calle delle Due Corti in the district of Cannaregio over by the Canale di Cannaregio, whereas his shop was in the city centre in Campo San Salvador. His brother Vincenzo and Bonaventura Marinoni, the son of one of his financiers, joined him in 1781; then in 1784 Marinoni retired. In 1791 Cozzi gave up his share to his brother and the company lasted up to the end of La Serenissima. 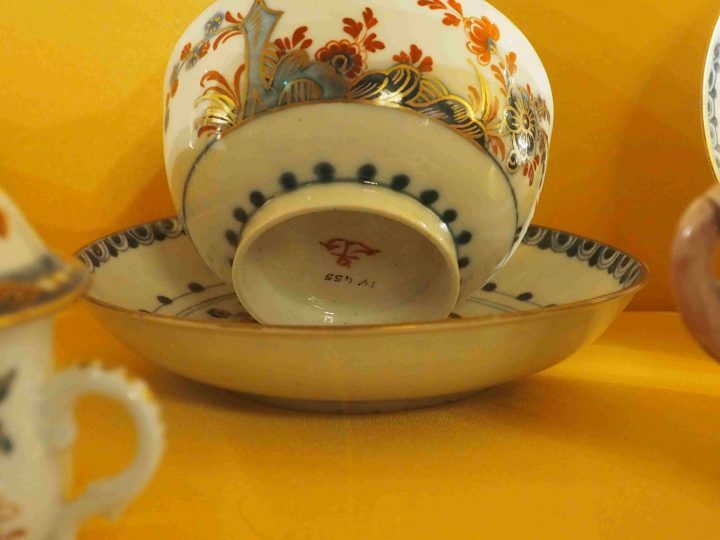 What made Cozzi such a successful and long lasting porcelain producer? In 2016 Venice celebrated in the Ca’ Rezzonico Museum 250 years since the opening of his company ‚Geminiano Cozzi e le sue porcellane‘. Although several documents were discovered in recent years we still do not know much about Cozzi. So how did he become a successful businessman and creative entrepreneur? First of all we know for sure he was a young and motivated man when he reached Venice. We know Geminiano Cozzi came from Emilia, being born in 1728 in Modena; he reached Venice poor in 1751; he only had summer and winter clothing and a few coins, that is what he wrote in his testament 1797. In his testament he also wrote his father’s name was Cozza, which he changed to Cozzi it 1751, when he reached Venice. Secondly he found a different solution for his China clay supply. 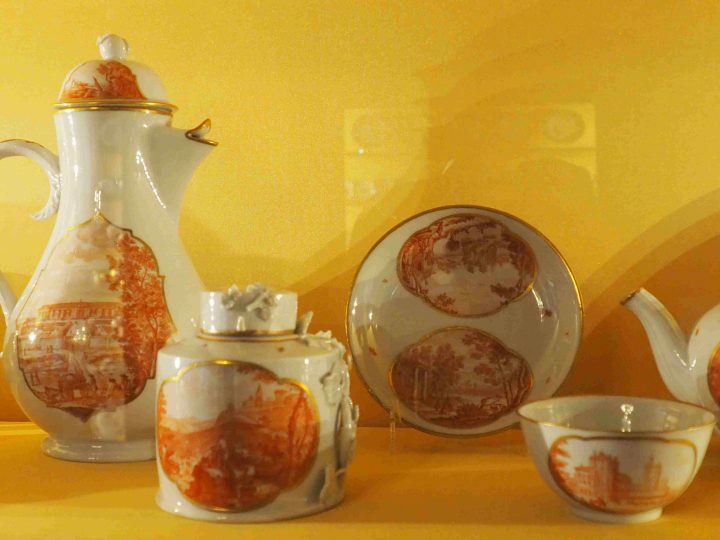 Porcelain is a mixture of kaolin rocks or China clay, and 2 minerals, feldspar and quartz. Cozzi’s kaolin came from the area near Vicenza from the caves of Tretto close to Schio, so he did not depend on importing from abroad; his two mills were situated in the district of Treviso. Thirdly he rightly interpreted the demand in Venice for what was called ‘white gold’. 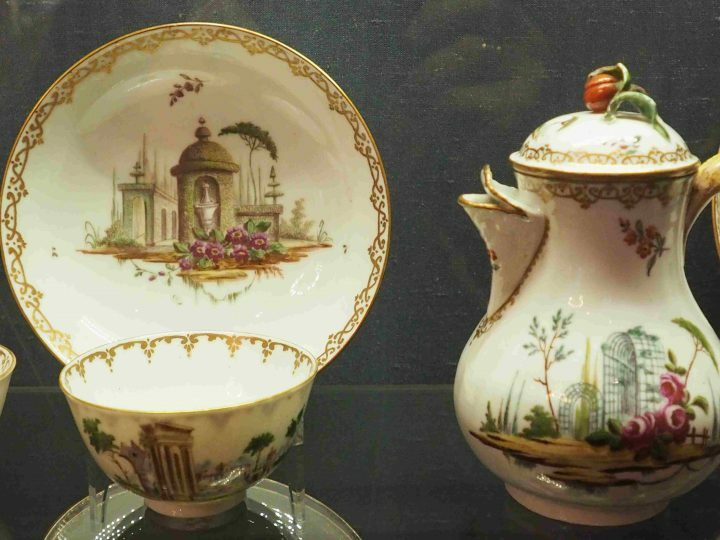 In 18th Century Venice drinks as tea, coffee and chocolate were very fashionable, dozens were the new coffeehouses greatly increasing the demand for porcelain. 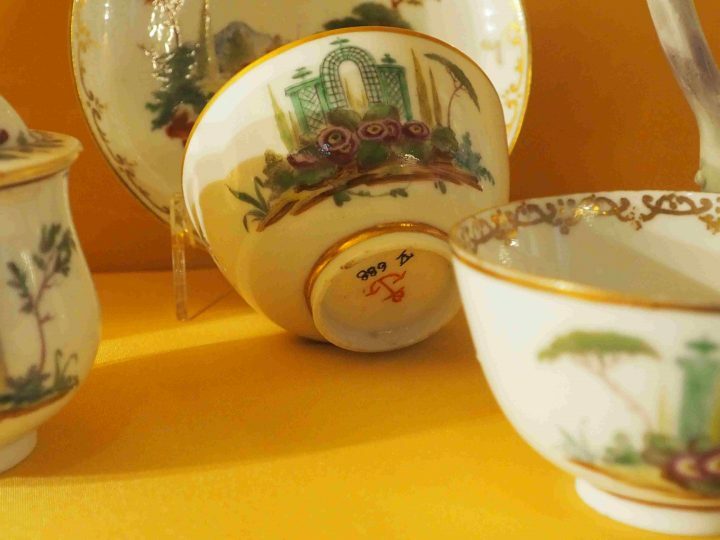 So Cozzi was able to satisfy the requests of the market, sometimes also replacing broken pieces ordered in Meissen. Fourthly he produced also less expensive ‘lines’ for the wider public proving himself to be a shrewd businessman. 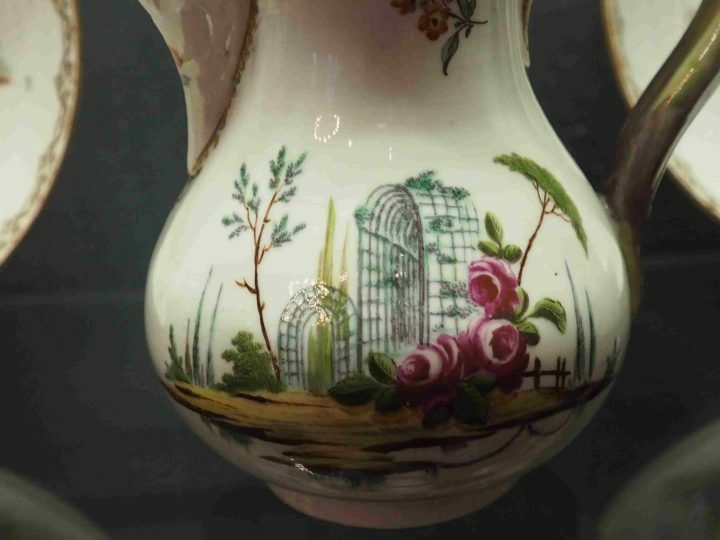 His production was very variegated, although he used the repertoire of the time: flowers from the Indies, German flowers, often freely adapted versions of Meissen porcelain. A much beloved theme was Villas and Bersò (from the French Berceau, meaning pergola and structures with evergreen trees). In the 16th Century Venetians had started spending more time on the mainland, so their villas had to represent their former grandeur. Venetians spent also a lot of time in their gardens and these themes, made popular through etchings by Ricci, Zais and Zuccarelli inspired also tea and coffee pots. 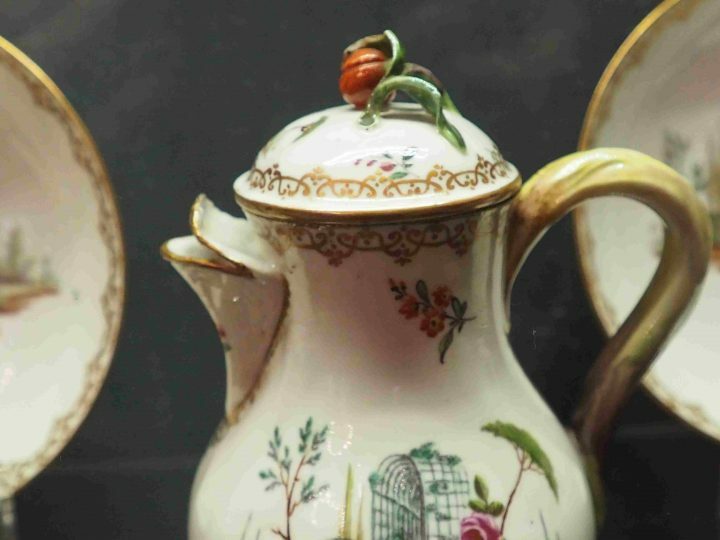 These coffee pots belong to the first phase of the production, around 1760. Red and violet flowers are clearly recognizable. 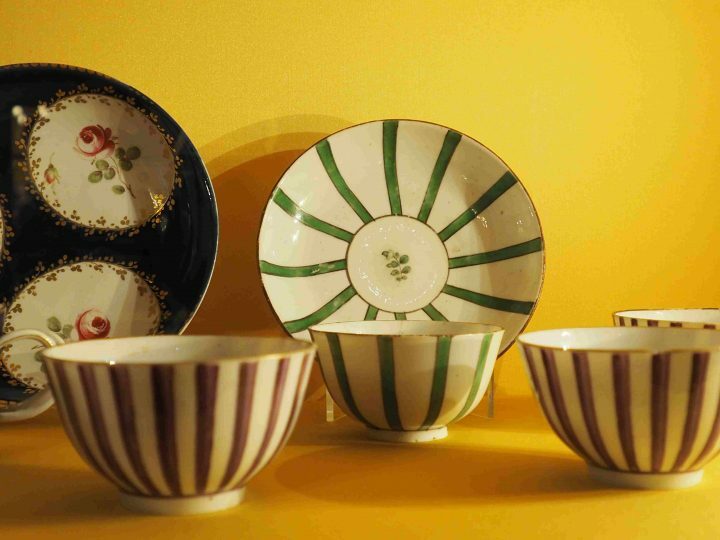 In 1770 this type of table service was redone with a simplified pattern. Small bottles also were decorated with this pattern. Here a bottle, probably a scent bottle. Decorations with fantasy Chinoiserie with dragons, invented animals with long feathers, pagodas, cherry trees were very much in fashion. Below a table service with scenes with Chinese men. 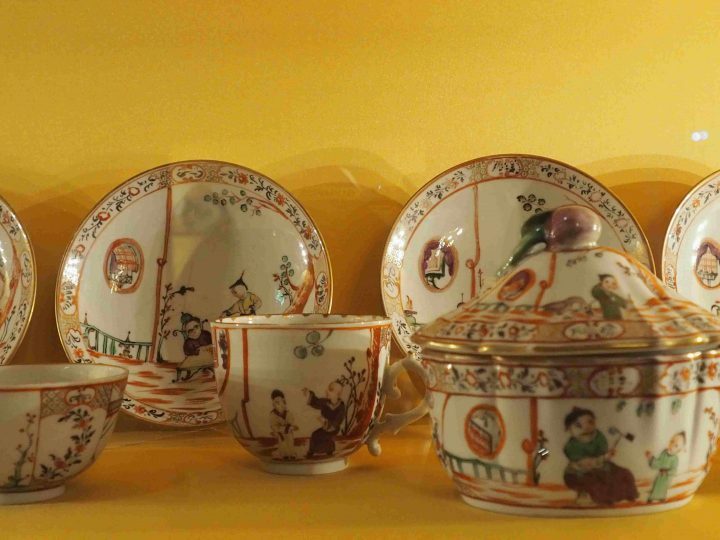 Imitation of oriental patterns were also very common, such as landscape Imari style. 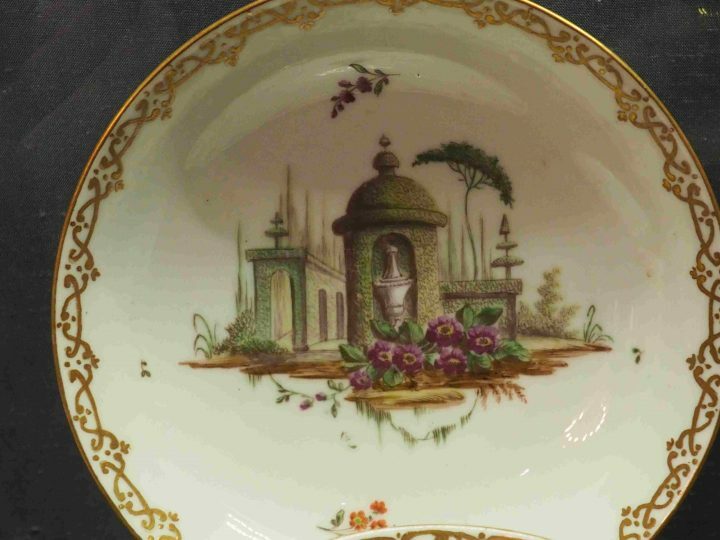 A beautiful service where also the mark under glaze is gold and not iron red is the one below. This theme was not very common as it did not allow a variaton of the theme, but Cozzi had to replace broken pieces for the families Emo, Grimani, Diedo, Cavalli. ‘A feston e cadena’, like a cobweb with wisteria (this was not an Eastern subject) in iron red and gold can be seen below. Geminano Cozzi died without heirs. Durability, graceful texture, vibrant colors: wares in porcelain, sculptures, plates, dishes and white figurines become rapidly popular. In every cup, in every piece there is history and tradition. Porcelain is timeless.